We push batteries to their limits and beyond in a new Energy Storage Technology Center, one of the largest state-of-the-art lithium ion battery and energy storage systems research facilities in the country. As today’s transportation technology continues to advance, Southwest Research Institute remains at the forefront, developing innovative solutions for safer, cleaner and more efficient vehicles. We combine our experience developing next-generation powertrain technology with extensive fuels and lubricants expertise to address our clients’ performance, efficiency and emissions challenges. As one of the largest independent engines, fuels and lubricants research facilities in the world, we test virtually every engine oil and fluid available on the market. We expanded our Ann Arbor, Michigan, technical center with engine development test cells — including one specifically for automated vehicles. These new facilities bolster our capabilities in high-efficiency powertrain development and emissions research in the Detroit area and augment the more than 200 research dynamometers at our San Antonio headquarters. Our new 12,000-square-foot Energy Storage Technology Center® is one of the largest state-of-the-art lithium ion battery and energy storage systems research facilities in the country. As development of tomorrow’s vehicle electrification ramps up, we are positioned to expand our battery performance and characterization, lifecycle assessment, and aging, temperature and abuse testing. We offer 10 battery testing chambers that run prescribed charge/discharge cycles under extreme temperature conditions. In secure chambers, we push batteries to their limits and beyond with penetration, crush, vibration, drop, accelerated aging, fire/flammability resistance, corrosion and overcharge testing. Powertrain components of hybrid-electric vehicles are designed to work together. We developed a high-fidelity, high-precision measuring system to study energy flow across subsystems of a plug-in hybrid electric vehicle to assess system synergy. Current U.S. Environmental Protection Agency certification procedures for hybrid vehicles lack the fidelity and precision needed for vehicle-level efficiency optimization. Because the engine, electric components, gearing ratios and power transfer devices are closely integrated and cannot operate independently, SwRI determined that optimizing electrified powertrains will require new methods and data acquisition strategies. In 2018, our particle emissions laboratory became the only one in the world that is fully accredited by the American Association for Laboratory Accreditation for calibrating equipment to ISO/IEC 17025. Particle emissions are a major health concern around the world, and the European Union, China and India are tightening regulations from combustion sources, including automotive and aircraft engines. SwRI’s particle emissions lab is certified to calibrate devices that measure surface area, mass, size, morphology, and particle number and particle sizes as small as 10 nanometers in diameter. An SwRI-developed combustion system enhances in-cylinder air motion at low speeds for large-bore spark-ignited engines. The design allows gasoline and other spark-ignited engines to be competitive in medium- and heavy-duty applications. Wet clutch friction performance is vital for automatic transmission operations and durability. SwRI oﬀers 12 test stands to determine automatic transmission ﬂuid compatibility with diﬀerent friction plate materials over a variety of operating conditions. Future emissions and fuel economy regulations are demanding more performance from heavy-duty diesel engines. To improve efficiency, SwRI is exploring how combustion optimization can increase peak cylinder pressure and how low-viscosity lubricants can reduce friction. We also developed a dynamic bearing test rig to advance diesel engine research through the Clean High-Efficiency Diesel Engine (CHEDE-VII) consortium. As the industry’s longest running diesel research consortium, CHEDE has more than two dozen client company members working to meet the needs of industry 5 to 10 years into the future. For years, the industry has been using bearing models based on archaic performance data. The new test rig supports bearing evaluations under today’s simulated engine loads of up to 250 bar peak cylinder pressure. We measure bearing friction, minimum oil film thickness and lubricant flow rates, which are critical to understanding bearing friction and updating bearing simulation models. Our dual-fuel technologies enable large, high-horsepower engines in the rail and mining industries to use a combination of diesel fuel and natural gas to reduce operating costs and harmful emissions. We completed a six-year contract with a large engine manufacturer to develop and put into production a dual-fuel conversion kit for locomotives, allowing engines to operate on up to 80 percent liquefied natural gas. 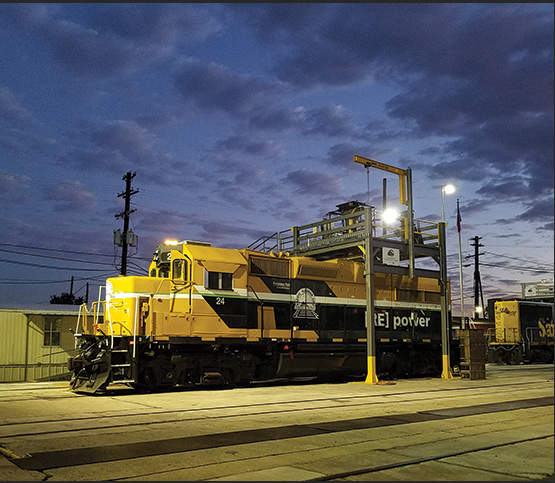 These engines meet EPA Tier 3 locomotive emissions requirements while retaining the ability to run on 100 percent diesel fuel. A similar approach also dramatically increases the use of natural gas in mining trucks. The method replaces stock diesel injectors with optimized common rail injectors, offering the industry a lower-cost alternative to more complex technologies under consideration. 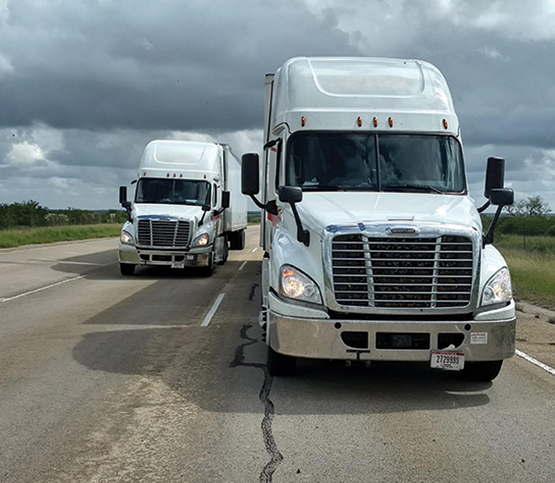 Initial results show a possible path to meeting EPA Tier 4 non-road emissions requirements without aftertreatment or exhaust gas recirculation systems. This year, SwRI engineers developed a mobile version of our Direct Electronic Vehicle Control (DEVCon™) system to evaluate the fuel economy of Class 8 vehicles on a test track. DEVCon-mobile is a first-of-its-kind system to control acceleration and braking for fuel consumption testing to the SAE J1321 standard. The system initially records a human driver’s pedal positions and then allows a robot to make small corrections to improve test repeatability. 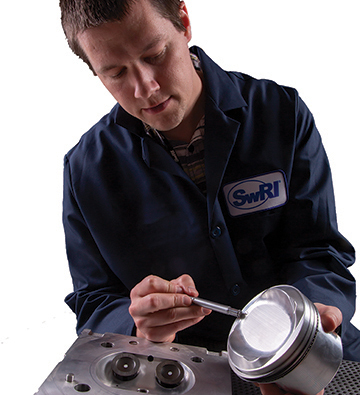 This increased driving precision allows SwRI clients to identify products that offer as little as 1 percent fuel consumption improvement. SwRI’s Locomotive Technology Center helps clients verify the performance of technologies designed to lower locomotive emissions. We conduct various evaluations, including a 3,000-hour California Air Resources Board verification test. A mobile version of our Direct Electronic Vehicle Control system evaluates the fuel economy of Class 8 vehicles on a test track. The system controls acceleration and braking for fuel consumption testing to the SAE J1321 standard. 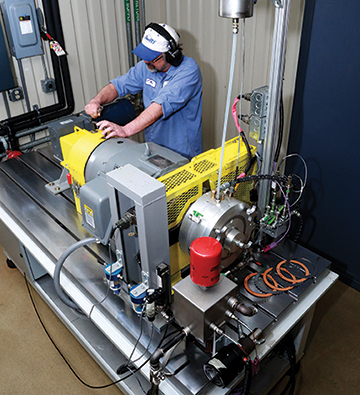 We developed a dynamic bearing test rig to measure bearing friction, oil film thickness and lubricant flow rates under simulated engine loads up to 250 bar peak cylinder pressure. In 2018, we modified the ASTM Volvo T-13 test that lubricant manufacturers use to develop products to extend the life of oils used in heavy-duty trucking applications. 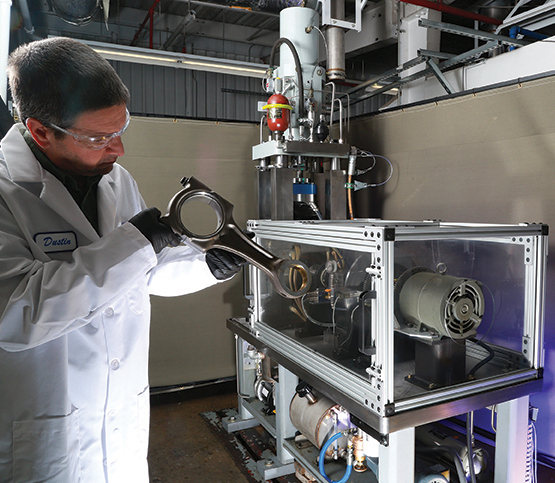 To mitigate fuel and hardware costs for the 360-hour procedure, our updated test method helps quantify how metal contamination, turbocharger selection, operating temperature and fuel properties contribute to the degradation of oil. For more than 60 years, SwRI has operated the U.S. Army Tank Automotive Research, Development and Engineering Center (TARDEC) Fuels and Lubricants Research Facility. Located at SwRI, TARDEC is a government-owned, contractor-operated facility providing advanced research, development and engineering, including filtration research, for the U.S. Army and other government agencies. Based on 2017’s diesel fuel filter test advances, SwRI is developing new methods for evaluating fuel, hydraulic fluid and lubricating oil filters under real-world conditions. These filters typically experience vibration, temperature cycling and variable flow rates in actual service. We are adapting current laboratory test technology to integrate vibration and cyclic flow effects to evaluate filter performance under dynamic conditions. These new tests supplement our existing standardized filter test capabilities. SwRI is a leader in developing and managing consortia that allow clients to pool their resources for pre-competitive research. Seven automotive consortia are currently active, including CHEDE mentioned previously. Also among these is the High-Efficiency Dilute Gasoline Engine consortium, which has spent more than a decade pursuing lower emissions and higher gas mileage. The Advanced Engine Fluids consortium is addressing low-speed pre-ignition problems, while the Advanced Combustion Catalyst and Aftertreatment Technology consortium began its second phase in 2018. The Energy Storage System Evaluation & Safety consortium is also in its second phase, evaluating and characterizing member-selected sets of batteries for performance, safety, cycle life and manufacturing. The consortium also benchmarks the latest electric vehicles. For more information visit automotiveengineering.swri.org or contact Vice President Daniel W. Stewart, P.E., via email or call +1 210 522 3657 or Vice President Steven D. Marty, P.E., via email or call +1 210 522 5929.